SEIKEN BUDO (combined-fist arts): Takeshin Seiken Budo combines GOKEN and JUKEN and adds studies of self-defense from various ranges from bo (six-foot staff) to grappling. These studies are modified traditional and non-traditional studies which include non-projectile weaponry and empty hand technique. BUSHIDO-KAI (Organization of the Way of the Warrior) was founded in 1970 as a martial arts school with an emphasis on the traditional Japanese arts of judo, ju-jutsu, and karate. 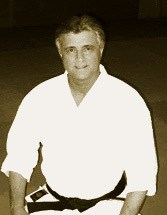 In 1977, Tony ANNESI, one of the early members of BUSHIDO-KAI and now its head instructor, settled in to full-time martial arts teaching. He had been trained in a number of martial arts and held black belts in judo, Kamishin aiki-ju-jutsu, Kamishin karate, and Shotokan karate. 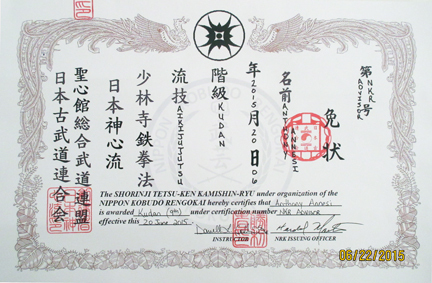 In 1984, Sensei ANNESI was appointed Soke-dai (inheritor designate) of the Kamishin-ryu martial arts and of the Kamishin-kai International and received a ranking of rokudan (6th degree). 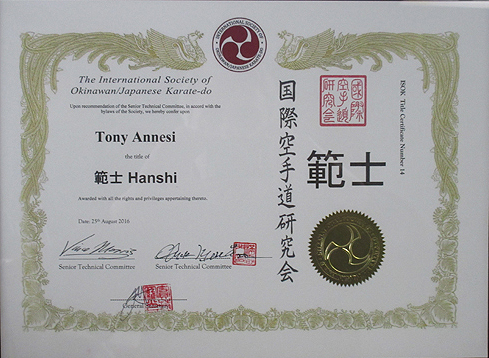 Two years later, ANNESI had earned the honor-title of Shihan Renshi (master instructor) through the Kamishin-kai's honor credit system and his dojo BUSHIDO-KAI was appointed the Hombu Dojo (central school) of the style. After rejuvenating a federation which had suffered from the loss of its founder (and Sensei ANNESI's teacher), Shihan Albert C. CHURCH, Jr., ANNESI felt that his ideas for moving the federation forward did not concur with the ideas of its leader, Catherine O. CHURCH, Shihan Albert CHURCH's wife and apparent successor. In order not to create a conflict, ANNESI resigned from the association of which he had been a part for 16 years. Former students petitioned ANNESI to form a new group so that they might continue to study under him and earn rank following the curricula and standards of his organization. After more than a year of consideration, ANNESI founded BUSHIDO-KAI KENKYUKAI (Way of the Warrior Organization Research Society) and the TAKESHIN SOGO BUDO (Bamboo Spirit Comprehensive Martial Ways). The TAKESHIN martial arts are a dai-sagari (branch development) of a number of the styles which Sensei ANNESI has studied, especially KAMISHIN-RYU and SHOTOKAN. It is a garyu or personal style and claims no historical inheritance beyond its connection with its root styles and arts. The term sogo budo (comprehensive martial way) was chosen to emphasize a simultaneously traditional and open philosophy of the martial arts. TAKESHIN martial arts are Japanese in origin with an historical influence from both Okinawa and China, but since martial knowledge is not relegated to one ethnic lineage, the TAKESHIN martial arts are open to concepts taught in other martial arts regardless of origin. After sufficient research and experimentation, TAKESHIN techniques may be influenced by or even replaced by improved methods. Traditional format and basic principles, however will remain unaltered. TAKESHIN is a traditional rather than a classical martial art. Although it is careful to honor and preserve the past, it does not ignore or discard scientifically developed and/or proven innovative practices. The words "TAKESHIN" were chosen because the richness of implications of these words in Japanese. Japanese words are written in kanji or Chinese ideographs which often have similar or identical pronunciations. Thus TAKE can mean Bamboo or Martial (another pronunciation of the BU in BUSHIDO-KAI.) This pronunciation simultaneously honors Sokaku TAKEDA of the DAITO-RYU whose family name means "Martial Field" and Albert CHURCH whose Japanized given name was TAKASHI (Noble One). Taken together TAKE-SHIN can be translated as BU-SHI, thus linking it to its original place of development, BUSHIDO-KAI. The Spirit of the Bamboo suggests both strength and flexibility, both hardness on the outside and softness on the inside, both the newness of natural growth, and the resiliency of the harvested stalk, both beauty and utility. Bushido-kai is open for private or semi-private classes only. Seminars and Master Classes are held at various facilities throughout the New England area. Take Exit 13; after the tollbooth, take the Framingham fork to Route 30 West; Take your left at major intersection onto Rt. 126; cross over Route 9 and drive 1.5 miles through downtown Framingham. Cross railroad tracks and route 135. Bear right after corssing rt. 135 to stay on Rt. 126. Local directions will be supplied via email or phone. Take a right after the State Police barracks onto Route 126 South; Follow 126 for 1.5 miles through downtown Framingham. Cross railroad tracks and route 135. Bear right after corssing rt. 135 to stay on Rt. 126. Local directions will be supplied via email or phone.